If there was ever a perfect Spring cake, it’s this three-layer Orange Cake, drizzled with syrup and filled and covered with creamy buttercream. 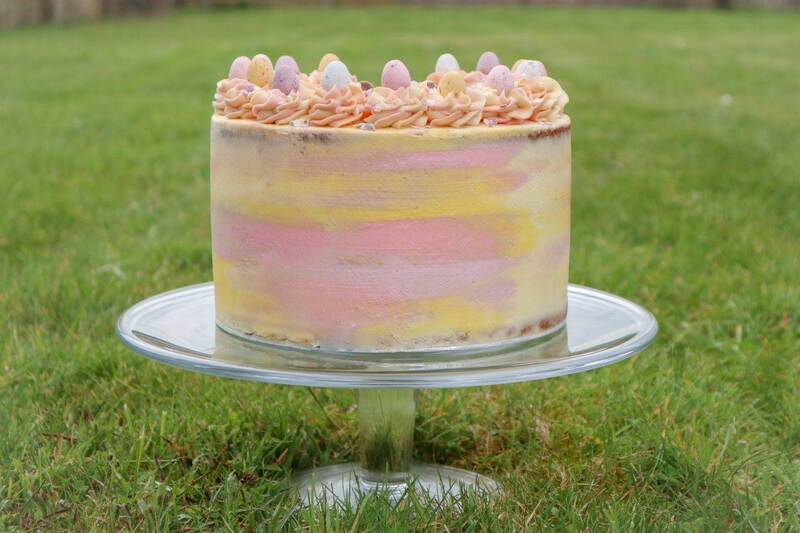 Easter is also just around the corner so I thought it would be a good idea to add a few Mini-Eggs on top too. Their pretty pastel colours inspired me to colour my buttercream to match and I’m so glad I did, it ended up quite pretty. Oranges are one of my most favourite fruits to snack on and I especially love a big glass of freshly squeezed orange juice over a cup of coffee any day – I know right, I love them that much! Tangy, zesty and super fresh they’re delicious. When in Rome a few weekends ago, read all about that here, I sat outside the Pantheon eating my breakfast, as you do, with a glass of Sicilian orange juice. I remember the waiter plonking this glass of bright red juice in front of me and I thought he’d brought me the wrong drink. He explained in that cool Italian way, with his fingers pinched, “no, signora, these are Sicilian oranges, try“! I did as I was told. I tried. I loved. I was hooked. Being the primary orange grown in Italy, the blood orange, known as tarocco, is a variety of orange with a crimson, almost blood-coloured flesh and when slicing open my step-daughter Lucy and me both got very excited at their deep colour and their intense smell. Rich in antioxidants they are super healthy too. Baking with them was completely new to me and determined to keep this cake as natural as possible with no extracts, I was really hoping the orange flavour would come through once baked. I ended up using the rind as well as just the juice. Brushing a sugar drizzle on to the sponges before icing also seemed to help. The end result was delicious! Preheat the oven to 160°C degrees (fan) and grease and line three 8inch non-stick cake tins with cake release spray and baking paper and have your ingredients weighed and ready. Grate 5 oranges then slice 4 of them in half and juice them (Save one orange for the drizzle later). Divide the mixture between the three cake tins and bake for 35-40 minutes, or until baked and a skewer comes out clean. Remove from the oven and leave to cool. Meanwhile, to make the drizzle add the sugar, water and the whole grated orange into a saucepan and bring to the boil, simmer for 3 minutes and when stirring squeeze the juice out of the orange as you go. Take off the heat and pour into a bowl or jug through a sieve and leave to cool. Your buttercream will also need making. Add the butter to your bowl and mix on a medium speed for 5 minutes. This will make sure it goes nice and pale and smooth. Add the icing sugar and mix until all combined. Using three small bowls add two large tablespoons of the buttercream to each bowl and colour using the food gels. Set aside for later. When your cakes are cool, slice of the tops to make them level and brush the syrup generously over each layer before adding your buttercream between the layers. Stack as you go and cover in the uncoloured buttercream using a spatular and cake scraper. Scrape again until smooth and blended. Do the same on the top. Decorate with Mini-Eggs or any sweets you fancy and throw a few sprinkles on for good measure. Cut yourself a big slice and enjoy! "(AD) Rome, a Foodies Paradise"